So here’s something that’s completely different. At least for me, it is. I tend toward baking and comfort food type recipes, so Chinese food is quite a departure. But I would say that these dumplings are the Chinese version of comfort food and honestly, I was really surprised by how much I liked them. And I should tell you that I don’t normally even like Chinese food. So that made liking these even more pleasantly surprising. My boyfriend loves Chinese food, though. It’s probably his favorite kind of cuisine. So when I was flipping though my cookbook one day and he saw this recipe, he said “You should make those!” and I reluctantly agreed because I’m an awesome girlfriend like that (…and I’m so humble about it 😉 ). But another reason I was weary about making this recipe, besides not liking Chinese food in general, and dumplings specifically, was that this is a recipe from my Weight Watchers cookbook . And while I love this cookbook and have been happy with almost all of the recipes in it, I don’t exactly equate Chinese food with healthy cooking. But maybe that’s just because the only Chinese food I like is the fried stuff? Anyway, I was very glad to have my all my assumptions proven wrong. Seriously, even if you’re like me and you don’t really like Chinese food, give these a try because they are like little pockets of yum. My boyfriend, who eats these all the time at Chinese restaurants, says they taste quite authentic, too. I liked that they weren’t overly greasy, which is probably my main problem with Chinese food. It’s the same reason I take all the cheese off of pizza before I eat it. It’s not that I don’t like the taste, but all that grease just makes my stomach hurt. At the same time, neither of us felt like this was a low fat version of pot stickers. It has the necessary amount of oil for the recipe to work, no more, no less. If I served them to you without telling you it was a weight watchers recipes, you’d never assume these were relatively healthy. They actually look a lot greasier than they are. That oily sheen in the photos is more from being cooked in chicken broth, than in oil. Don’t be scared by the amount of ingredients. If you cook regularly, especially if you try to cook ethnic foods, you probably have most of the ingredients in your pantry. The only thing that was an issue for me to get was the wonton skins. Look for them in the freezer section of your grocery store, but if you can’t find them (I couldn’t), you can get them from an Asian grocery (same with the rice-wine vinegar, although my supermarket had that). We had these with some fried rice, though I’m sure they’d be great with stir fry or anything like that. They’d make good appetizers for a dinner party. My boyfriend was snacking on the leftovers for days, even eating them cold, straight from the fridge because he liked them so much. You may want to try to find another recipe to serve them with that uses Napa cabbage, as a head of this cabbage is very large and you only need half a cup for this recipe. I wound up having to throw the rest away since I didn’t know what else to use it in. I’m on the lookout for another recipe with Napa cabbage if you have suggestions! Combine chili sauce, cilantro, teriyaki sauce, vinegar, ginger and cayenne in a small bowl. Set aside. In a medium bowl, combine the chicken, cabbage, scallion, soy sauce, dissolved cornstarch, mustard and pepper. Make some room on your counter and get the wonton skins and a small bowl of water. Working with one wonton at a time, spoon 2 tsp. of the ground chicken mixture into the middle of the wonton. 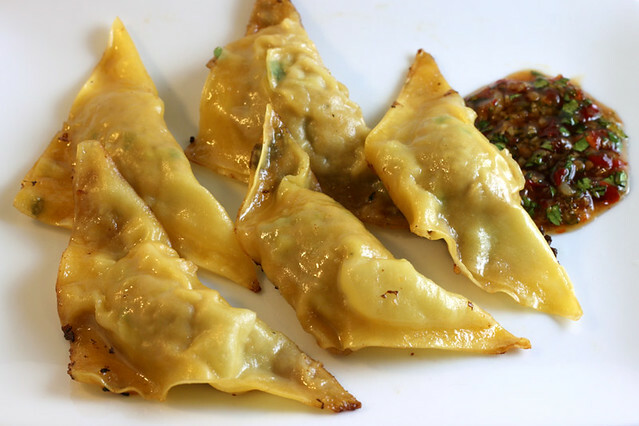 Using your fingertips, Moisten the edges of the wonton with water, then fold diagonally to form a triangle. Seal the edges carefully, pressing out any air. Repeat with remaining wontons and filling. 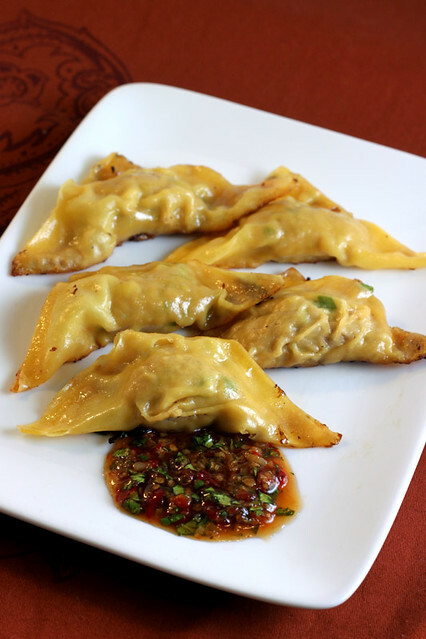 Wonton skins will start to dry out, so keep them covered in plastic while you are working. Note: You may need to do the next 3 steps in two or three batches (or multiple pans) depending on how big a pan you have, so remember to divide up your oil and broth accordingly. In a large nonstick skillet, heat the oil over medium-high until it’s very hot but not smoking. Place the dumplings in a circle in the skillet. Reduce the heat slightly and cook 5-7 minutes or until the bottoms are golden. Meanwhile, in a small saucepan, bring the broth to a boil. Remove from heat and sprinkle in the flour; stir until dissolved. Pour the broth over the dumplings and cook, partially covered, until the liquid evaporates. Uncover and cook until the bottoms are crisp. Carefully loosen the dumplings with a spatula. Sprinkle with sesame seeds (if you want) and serve with the sauce on the side, for dipping. napa cabbage is awesome cut really thin in stir fries with chicken, mushrooms, onions, teriyaki sauce. It soaks up all the yummy sauce. These potstickers looks great! I love the browning and shape of them. .-= tia @ buttercreambarbie´s last blog ..Strawberry Cheesecake Surprise Muffins =-. WOW, Weight Watchers has come a LONG way! These looks sooo yummy. .-= leslie´s last blog ..The Best Tea Sandwiches EVER! =-. So glad you switched up your cooking for this savory recipe. Homemade Chinese food hits the spot! .-= The Duo Dishes´s last blog ..No Dud of a Spud =-. Do you know how many points plus this is? Thanks! I am so excited to try it! I just recalculated and it comes out to 7 pts under the new plan. I added all the specific values under the recipe. Hi there! What’s the sodium content of this recipe? Thanks so much! I just checked my cookbook and it says there’s 570mg sodium in this recipe. Hi there. Just stumbled across your website from pinterest.com. I love these dumplings but the chinese restuarant in my hometown doesn’t serve them. So excited to try. FYI…i am able to find wonton wrappers in the produce section. usually with organic veggies.